It does seem an opportune time in history to read and think about character. In North America we seem to have a recent propensity for political wars, for a failure to listen to each other, for a simple-minded politics that suggests, much like religion, that my side has the truth and your side is completely without value and should be, at the least, shouted down or charged with a "crime" such as "false news" or lying. 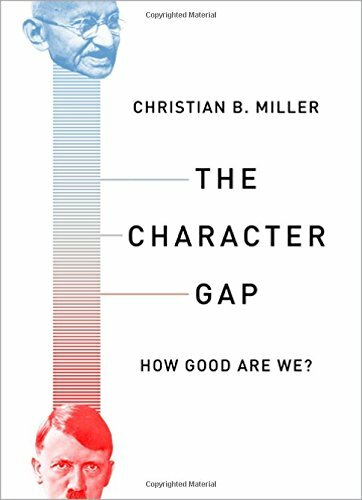 Miller's book is one in the series called small books with big ideas – and the big idea is that we really can improve our character if we try. Throughout the book I am reminded of the Camus observation quoted above from his "Notebooks". Yes, people are to a large degree what we expect them to be. Treating people as sensitive, honest, caring humans will often (not always) yield positive results. Camus's is an observation; Miller supports his claims with hard evidence. Professor Miller is A. C. Reid Professor of Philosophy at Wake Forest university and Director of the Character Project, funded by the John Templeton Foundation and Templeton Charity Foundation. "He is the author of over 75 papers and two books, Moral Character: An Empirical Theory and Character and Moral Psychology also published by Oxford." On one occasion, while clerking in Offutt's store, in New Salem, Ill., he sold a woman a little bill of goods, amounting in value by the reckoning, to two dollars and a quarter cents. He received the money, and the woman went away. On adding the items of the bill again, to make himself sure of correctness, he found that he had taken six and a quarter cents too much. It was night, and , closing and locking the store, he started out on foot, a distance of two or three miles, for the house of the defrauded customer, and delivering over to her the sum whose possession had so much troubled him, went home satisfied. The emphasis throughout the book is on the review of psychological results, for example, a thoughtful review of what we learn from the famous Milgram test, and how those results help to define the way we humans actually are in the world – what we do in various demanding situations and what we do NOT do when called upon to act. So, yes, in a sense the book can be read as a "self-help" book offering strategies for how to improve our character. But it is much more than that: it is also a thorough review of psychological studies related to character, actions in stressful situations, and the overriding idea that humans "have powerful capacities for good sitting side by side with powerful capacities for bad." And interestingly the idea that our behavior is often influenced by several external forces: other people, what others in positions of authority tell us, guilt, praise, hope for reciprocal good behavior, and the like. Again, the descriptions of these situations and actions are supported by empirical evidence. How many philosophy books have discussed "the fly in the urinal"? This book does! "Nudging" has been used in many different attempts to change behavior: smoking, organ donors, road manners, and so on. It proves to be a powerful tool. It is easy to see how the book could be found in the self-help section of your library, but it is much more that that. The final chapter is titled "Divine Assistance" and discusses the potential power of religion, particularly Christianity, to help believers reduce the gap between who they are and who they could be: virtuous human beings. The book is an easy to read, thoughtful, empirically supported discussion of character.